Lois Lowry’s The Giver is a visual novel. It’s not filled with colorful illustrations, but reading is certainly a visual experience, one that everybody imagines in their own way. Comic book creator P. Craig Russell has revealed his own vision for The Giver—and, in this interview and exclusive preview, he shares how his use of sparse color and stark contrasts show this world of nothing that’s on the brink of something. I’ve had a chance to read the upcoming graphic novel adaptation of Lowry’s The Giver, which is set for release on February 5 by Houghton Mifflin Harcourt. It’s been adapted by Russell with most of Lowry’s original words, and illustrated by Russell, Galen Showman, and Scott Hampton. It’s the first time the 1993 children’s novel has been rendered in comic book form, a medium that feels long overdue. The story is about a young boy named Jonas who’s grown up in an idyllic community where emotions are suppressed to keep everyone content. However, upon learning he has a gift to access memories of the distant past—bringing literal color into his life for the first time—he realizes everything the world has lost. How pain, loss, and even death are a worthy price for love. The graphic novel is a brilliant translation of the source material, because of how it uses color and contrast to represent Jonas and his world. While the 2014 movie starring Jeff Bridges, Brenton Thwaites, and Meryl Streep simply went from black and white to full color to show Jonas’ growth as the new Receiver of Memory, the graphic novel takes a different approach, which you can take a look at in these images debuting exclusively on io9. 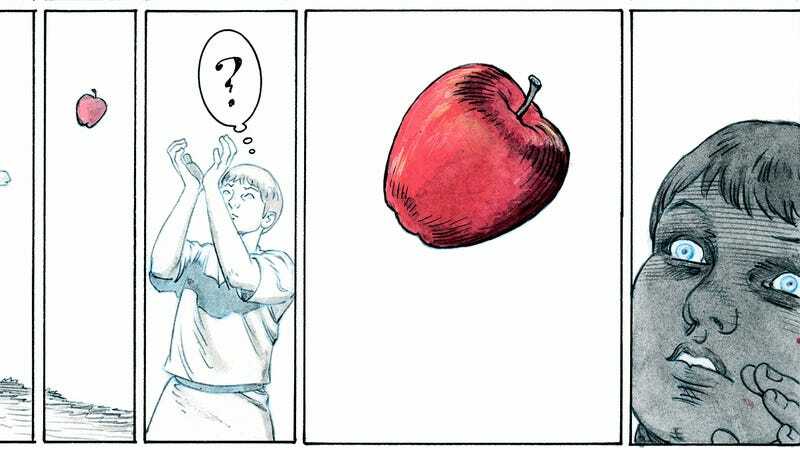 In this exclusive look inside The Giver’s graphic novel, Jonas sees the color red for the first time. All images: Houghton Mifflin Harcourt. Speaking to io9, Russell explained how, in order to represent Jonas’ frame of mind, he removed color almost entirely in his designs. But unlike what you might be thinking, most of the graphic novel isn’t in traditional black and white, it’s done in outlines of black and blue; using the negative space inside the scenes and characters to turn Jonas’ world into an actual void. Russell said this was a way to convey the absolute sameness of Jonas’ world, as well as how hollow it actually is. You still need the sense that the color is missing, as opposed to just a black-and-white comic book or a black-and-white movie. If you’re looking at a really beautifully filmed movie in black and white, like Citizen Kane or whatever, you don’t have the feeling the color is missing, because the grays are so rich. I could have done that working with black ink and ink wash. But it would still feel like you weren’t missing the color. I wanted with this very hint of a color, and the silvery greyness with the blue, to make it look like a tonal world in which color was drained. Whether that works or not is up to the viewer. It does work, especially when you add Jonas’ memories into the picture. In the original novel, the memories Jonas experiences are written in a way that encourages the audience to experience them alongside him. After all, the story is fundamentally about the power of memory, and this is where the original novel shines. It’s easy to close one’s eyes and imagine the vivid feelings of riding a sled, sitting on the beach in the sunshine, or being with family during the holidays. However, this is a hard concept to portray visually. Because, even though readers understand these things, Jonas does not. He isn’t just waking up over the rainbow like in The Wizard of Oz, he’s learning what a rainbow is. It’d be like if we discovered a new color. It’s that new. How do you visually represent something that complex? Well, Russell did it by keeping the memories simple. For most of the graphic novel, they’re largely illustrated in the same black and blue outline—with one noticeable difference, a single pop of color. Russell said he designed it to not only symbolize Jonas’ changing worldview, but also the mood of the memory he was witnessing. For example, the war memory is engulfed in a bright, yet ugly orange, conjuring the feeling of fire, heat, and decay. Russell also didn’t want to undercut the final scenes after the escape, which he wanted portrayed in full color to represent the real, fully realized world. The Giver’s ending is famous for its ambiguity. Jonas has escaped from the community, stealing his young charge Gabriel away before he can be mercy killed. Jonas and Gabriel struggle to survive in the wilderness, and Jonas fears they may not survive. When it seems like they’re on the brink of death, Jonas finds a sled (just like the one from his first memory) and uses it to find his way home. Should it be taken literally—with the two young boys racing downhill toward a new life—or did the two of them actually die, lost in a memory of what could have been? I thought the telling point [in the novel] was that, at this moment of near-death from hypothermia, he finds a sled. And it’s a red sled. Well, that’s one of the first pleasant memories he had. What are the chances at this point of finding a red sled that will take him to freedom? It was too much of a coincidence. I always thought that was his imagination, or he was playing with that memory—as he had used other memories as a way to cope. He goes down the mountain, and those little points of light, those little warm little windows, grow and grow until they’re like he’s engulfed in stars. The snow turns into these big warm stars...[then] you turn the page, and see that abandoned bicycle lying in the snow. That, to me, meant that they did not survive. But that even so, it was worth it. Just for that short period of ecstatic freedom from this horrible, horrible place he was escaping. The graphic novel may not be how all of us imagine Jonas’ world to be—whether it’s Russell’s use of color or how he interpreted the ending—but it’s still a powerful and symbolic representation of an equally powerful and symbolic story. It may have taken decades to bring The Giver to this medium, but based on the result, it was well worth the wait. The Giver graphic novel comes out on February 5. I also talked with Lowry about this latest adaptation, so keep an eye out next week for more.